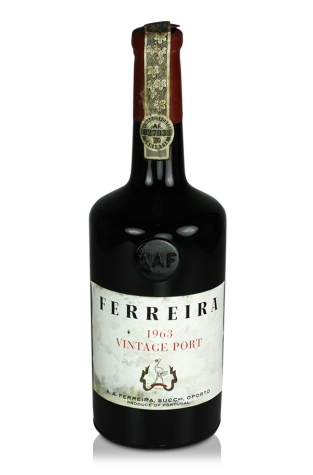 The 1963 vintage was exceptional and no other vintage can claim such a roll of classic vintage ports. The Ferreira port house is hugely underrated when it comes to any discussion of the great port houses and this vintage provides ample testament to that fact. The 1963 is now showing a distinct tawny colour with figs, raisins and dried fruit on the nose and an interesting touch of sous-bois with some clinical undertones. It is medium-bodied and has great acidity despite being somewhat sweeter than other ports of this age. The finish is extraordinary and the complexity on the palate is evident. A well-crafted and complex port, fully mature, with robust and rich flavours of plum and tobacco. The port house of Ferreira was the first to be established by local growers and it has a history dating back to 1751. 1988 saw its sale to the Sogrape conglomerate.